Bring the indoors out to your patio, deck, or favorite outdoor entertaining area with the Dimplex Electric Fireplace. 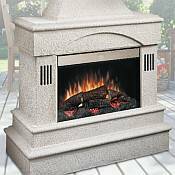 The Rocklin Electric Outdoor Fireplace is constructed so that you can enjoy the look of a real flame with its weatherproof 26 inch firebox and patended Dimplex electric flame technology. The Rocklin has a stone mantel and is mounted with speakers and an audio jack input for your favorite music collection. Great relaxing spot for the end of those hectic busy days. Curl up next to the Rocklin Outdoor fireplace and plug in your stereo, MP3 player or CD player. The Rocklin electric fireplace is low cost to operate, which means you can enjoy hours of entertainment without the high energy costs. 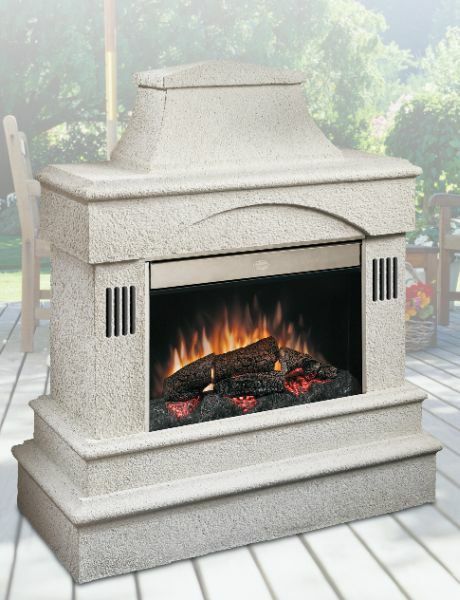 Allows you to enjoy the Outdoor Electric Fireplace year round. The Rocklin electric outdoor fireplace is stylish with a stone mantel, built in speakers and audio jack input. It generates no heat, so you don�t have to worry with setting it away from your favorite furniture décor. Dimentions:44-3/4" x 51-3/4" x 21-1/4"